Fri., Jan. 5, 2018, 2:54 p.m.
STREAKS, STATS AND NOTES – Rams’ first playoff game in 13 years is against defending NFC champions. … Falcons were NFL’s highest-scoring team last year. Rams were tops this year. … Falcons in postseason for second straight year after last season ended with memorable collapse in Super Bowl. … Falcons routed Rams 42-14 at Coliseum in December 2016. Rams coach Jeff Fisher was fired next day, eventually paving way for Sean McVay, who went to high school near Atlanta. … QB Matt Ryan making sixth playoff trip in 10 years. He had 20 TD passes this season after throwing 38 last year as league MVP. … Rams offensive coordinator Matt LaFleur was Ryan’s quarterbacks coach last season. … Falcons’ offense didn’t flow under first-year coordinator Steve Sarkisian, who coached USC at Coliseum until getting fired in 2015. … Falcons put starting LG Andy Levitre on injured reserve this week, changing O-line dynamic with Rams line-wrecker Aaron Donald looming. … Falcons WRs Julio Jones and Mohamed Sanu remain among NFL’s best duos, combining for 2,147 yards and eight TDs. … Rams GM Les Snead was in Falcons’ front office for 13 years, and assistant GM Brian Xanders worked for Falcons for 14 years. … Rams earned first winning season and NFC West title since 2003 and first playoff berth since 2004 season with spectacular one-year transformation under McVay, now youngest coach to make playoffs in NFL history, breaking record set by 33-year-old Ray Flaherty with Washington in 1936. … No rookie head coach won NFL playoff game in any of past four seasons. … Rams hosting wild-card playoff game for second time in franchise history, first since December 1984 in Anaheim. Rams haven’t had playoff game at Coliseum since Jan. 7, 1979. … Rams are only 4-10 at Coliseum in two seasons since relocation, going 3-4 this year. … LA went from 32nd in NFL in scoring in 2016 to first in 2017. … RB Todd Gurley led NFL with 2,093 yards from scrimmage and 19 total TDs. … Rams LT Andrew Whitworth was key to turnaround. He is 0-6 in playoffs during career spent previously with Cincinnati. Whitworth is one of six Rams with playoff experience. … Counting on new K Sam Ficken after Pro Bowl selection Greg Zuerlein got hurt last month. … Rams defensive coordinator Wade Phillips was Falcons defensive coordinator and interim head coach in 2003. … Rams’ last playoff game was at Atlanta in January 2005. Michael Vick ran for 119 yards in Falcons’ 47-17 win. … Rams are second team in NFL history to host playoff game in temporary home stadium. Minnesota did it three years ago. LOS ANGELES – Matt Ryan and the Atlanta Falcons visited the Coliseum late last season on their path to the Super Bowl, and they easily racked up a blowout victory over the woebegone Los Angeles Rams. When they return on Saturday night for their NFC wild-card playoff opener, they might hardly recognize the guys in the horned helmets on the other sideline. That 42-14 loss to the Falcons was a catalyst in the Rams’ transformation from LA laughingstocks into NFC West champions, because coach Jeff Fisher was fired the next day. One month later, Sean McVay was hired to lead the most incredible one-year turnaround in recent NFL history. Led by the 31-year-old McVay, who grew up near Atlanta, and a roster of playmakers including Jared Goff, Todd Gurley and Aaron Donald, the Rams (11-5) are in the playoffs for the first time in 13 years. The NFC’s third seed drew a tough matchup with 2016 league MVP Ryan and the Falcons (10-6), who appear capable of making another conference run. But the Rams expect to feed off the excitement of a city hosting its first playoff game since the LA Raiders’ last postseason trip 24 years ago. 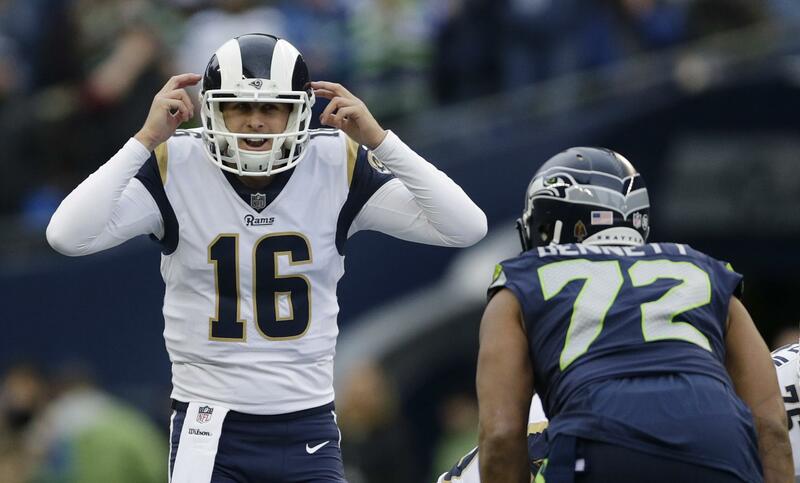 Goff, the second-year pro coming off a transformative 3,804-yard season , is eager to face off with Ryan, who is in the playoffs for the sixth time in 10 years. Both teams have a wealth of offensive playmakers, from Rams MVP candidate Gurley to star Falcons receiver Julio Jones. The Falcons are back for their first postseason game since that memorable Super Bowl collapse against New England. That loss could have broken weaker teams, but coach Dan Quinn kept this bunch together – and now they’re the only group in the six-team NFC field that also made the playoffs last season. Although both defenses are statistically solid, this game could turn into a shootout. The Falcons led the NFL in scoring last season, but the Rams took over the top spot this year in McVay’s worst-to-first revitalization of the LA offense. Ryan and Jones have the skills to pick at the Rams’ secondary if Donald can’t be disruptive, while Goff and the versatile Gurley are eager to make their first mark on postseason football. The teams’ coaching staffs have multiple ties and similarities. Rams offensive coordinator Matt LaFleur was Ryan’s quarterbacks coach last year, although LaFleur claimed he doesn’t have much insight to offer on the star passer or the Falcons’ offense. That offense is run by Steve Sarkisian, who knows the Coliseum extremely well: He coached at USC as an assistant and a head coach until getting fired midway through the 2015 season. Rams GM Les Snead and assistant Brian Xanders are products of the Falcons’ front office, too. The Rams didn’t earn a first-round bye, but McVay essentially took one anyway by resting his biggest playmakers for last week’s regular-season finale. The decision likely cost Gurley the NFL rushing title, but should pay off with rested skill-position players. In the ultracompetitive NFC South, the Falcons had to grind into the final week to secure a wild-card spot with a 22-10 win over Carolina. The Rams’ three top special-teams talents all earned Pro Bowl recognition, but kicker Greg Zuerlein is out for the season with a back injury. Zuerlein’s reliability was an enormous asset, and Los Angeles’ new kicker is Sam Ficken, who was working at a brokerage firm in Connecticut recently. If the game comes down to a kick, the pressure will be big. Published: Jan. 5, 2018, 2:54 p.m.